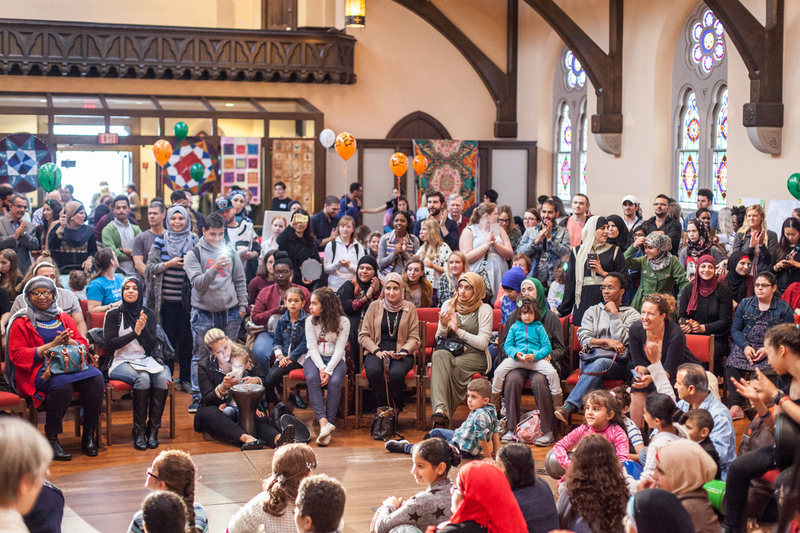 Al-Bustan Seeds of Culture began work in 2002 with the inception of an Arabic language and cultural day camp that has served over 1,000 Philadelphia youth. 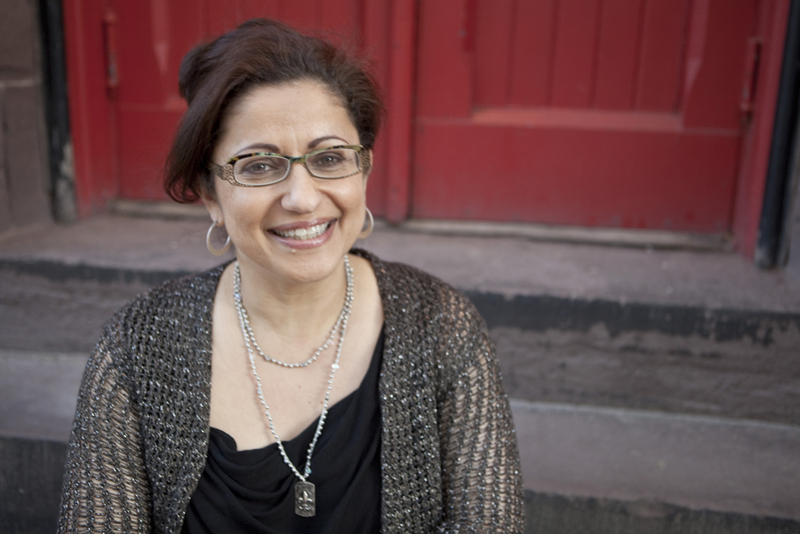 Under the leadership of its Executive Director and Founder Hazami Sayed and with essential help from a rotating cast of staff members and collaborating artists, the organization has undergone a variety of creative expansions over the years. The most recent of those expansions is an emphasis on exploring community and identity through creative interventions in the public space. 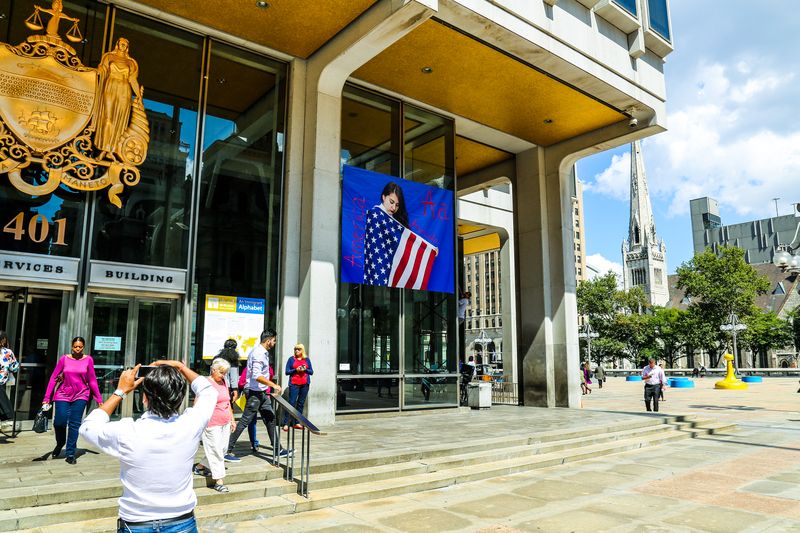 In 2017, Al-Bustan worked with visual artist Wendy Ewald and students from Northeast High School to install “An Immigrant Alphabet” at Thomas Paine Plaza in Center City. 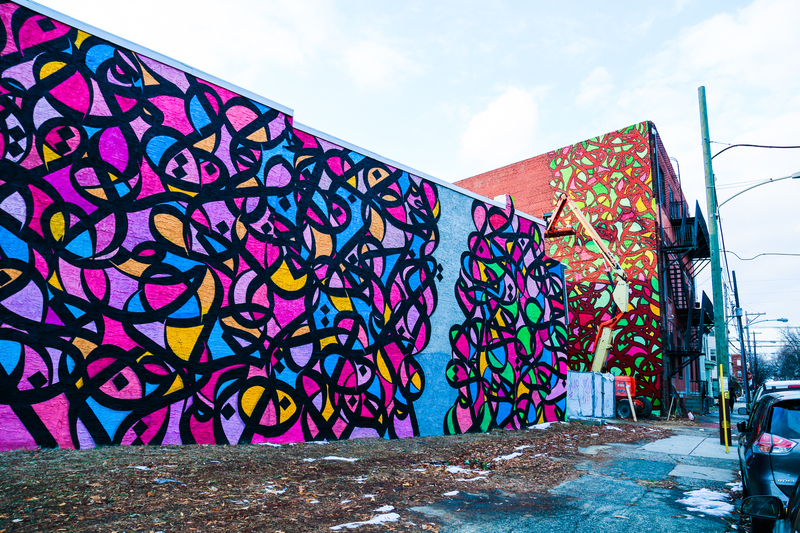 In the same year, the organization brought internationally renowned artist el Seed to West Philadelphia for a community mural project. Hoping to learn from and build upon the success of those two projects, Hazami and the Al-Bustan team remain devoted to utilizing public space for the purpose of fostering inclusivity and cross-cultural exchange. I was thinking of youth and education and what does it mean to raise two young Arab boys in America, and how do we help them navigate their identity and place here? I love cities. I would only live in cities. I have never lived in the suburbs and never intend to. We lived in New York City about nine years and then moved twenty years ago to Philadelphia. So Philadelphia’s home now, it’s been for some time. Our older son Mazin was born in New York City and our second son Jad was born in Philadelphia. At first I kept comparing it to New York City because we had lived in Manhattan and I thought This isn’t anything like Manhattan! I wanted more density and I wanted more activity, more “eyes on the street,” and initially I really wanted us to live in Center City. But my husband, Omar Blaik, and I ended up moving here in West Philly and buying this house twenty years ago. The city gradually grew on me. Being that it’s a college town, I found that there’s a lot of interesting people that come through—whether students, academics, administrators, visiting scholars—this always creates an interesting mix of people to meet and types of events to attend. I also quickly discovered that West Philly is both ethnically and socioeconomically very diverse, and I appreciated that. And as our boys started school, I found an ease in getting things done that would’ve been much harder in a bigger city. There’s a different pace of life and network of people here that I started to appreciate more. I’m an architect by training, in grad school I completed a Masters in Architecture and I practiced as an architect, though initially I did some urban policy related work. I worked at the UN Development Program in NYC for a couple of years, and that was an interesting opportunity to learn about cities globally, to understand urban development issues from both a governmental and NGO [Non-governmental organizations] perspective. Then I shifted into working in architecture, at the firm Magnusson Architecture and Planning. I was interested in a firm that was doing work around affordable housing and community development in the South Bronx, so that’s where I worked for most of my time in New York City. Being a designer, I’ve always appreciated the arts. I do some art on the side myself. I do photography, I’ve done printmaking, I’ve worked with pottery, I like to sketch. Sometimes on vacation, you know, this last trip we took to Lisbon, I took my sketchbook with me. So those are my personal artistic interests. I started this non-profit in 2002. I was thinking of youth and education and what does it mean to raise two young Arab boys in America, and how do we help them navigate their identity and place here? My husband and I both were born and raised overseas and came to the U.S. as college students. I’m Lebanese-Egyptian, but I grew up in Kuwait. He’s Lebanese, but was born and raised in Egypt. He came to the US for grad school, I came as an undergrad, so we thought deeply about What does it mean for our sons to be born and raised here? We wanted them to be fully bilingual, in addition to the Spanish they learned at school. We wanted to be sure that Arabic was something that they could learn when they were young. Since they started kindergarten we figured out a way to retain a tutor on a weekly basis, so that they were learning to read, write, and speak Arabic. And we traveled at least once a year overseas, so they could meet family, friends, and converse and be able to function in an Arabic speaking environment. Starting Al-Bustan was an opportunity to think about language and the arts as part of culture. To learn about another cultural tradition and people, it’s preferable to learn the language, it really helps. Inversely, as you’re learning a new language, it helps to know something about the culture, and the arts are an intrinsic part of that. That’s what got me to think about a summer camp program that would be open to kids of all backgrounds, those of Arab heritage or those interested in learning the language or learning about the culture, who maybe don’t get to travel overseas as much. So how could they have that experience while being in Philadelphia? And that’s how we started Al-Bustan with an Arabic language and cultural day camp that has a different theme each year integrated across language, arts, and science/nature. It’s a program that we’ve learned a lot from, we’ve served over a thousand children, teens and counselors over the years. Many campers come back as counselors for several years and counselors have an equally enriching experience that’s eye-opening for them in multiple ways. So we have kept a continuity, which is nice to see, y’know, kids that end up going to college and we still stay in touch with them. By 2011 we realized that to have a broader presence in the city, and beyond in schools and educational settings, we needed to also feature artists. We needed to work with teaching artists, while also featuring them as performers and artists in their own right. So we tweaked our mission to emphasize both teaching and presenting. Initially we were just teaching youth, and then transitioned to include adults as well–particularly in teaching music. 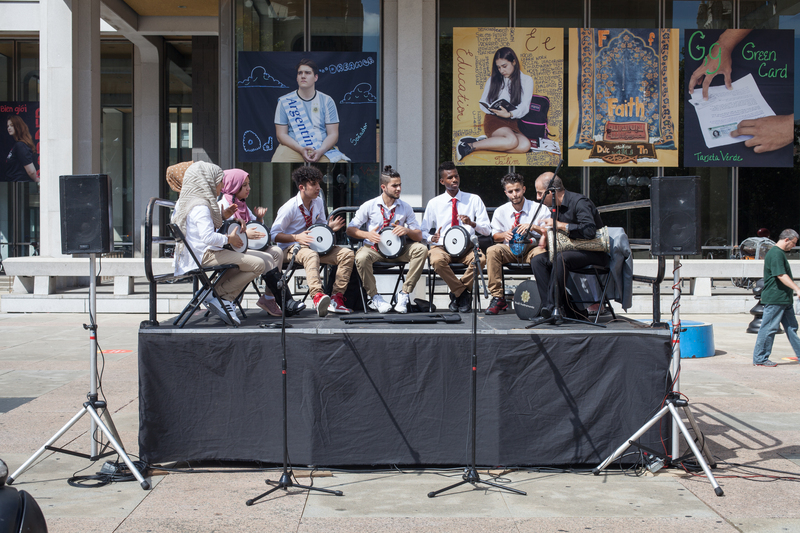 We currently have a percussion ensemble led by our Percussion Director Hafez Kotain that meets in West Philly and is open to adults and high school students. In 2011, we started a concert series. We had a music director, Hanna Khoury, who had an expansive vision which we ran with—presenting a series of five or six concerts each year featuring renowned artists nationally and from around the world, who were invited to collaborate with a resident classical Arab music ensemble led by Hanna. You can see many video clips on our YouTube channel and the CDs that we’ve produced. Many Northeast students were either born overseas or have parents who were born overseas, so what does that mean and how can we reflect that? This diversity isn’t always channeled in positive ways, it isn’t seen as an asset that’s really harnessed effectively… So how can we nurture cross-cultural exchange in intentional ways and use it to uplift many of these voices? An Immigrant Alphabet project has its seeds from 15 years ago when I learned about Wendy Ewald’s work as a photographer. She had a retrospective at the Queens Museum of Art in 2003, and I read about it in the New York Times. It was during the Iraq war, and the front cover of the “Nation At War” section had this image of a special exhibit titled The Arabic Alphabet, which immediately caught my attention There were 28 large banners for each letter in the Arabic alphabet with Arabic script and images she had created with middle school kids that she worked with in Queens. And so I learned about her work, I went to see the exhibit at the Queens Museum, I connected with her, and I stayed in touch, continuing to think about how could we, as an Arab arts organization, imagine a project that could apply some of the tools and approaches to this collaborative art-making that Wendy does so well. Northeast High School is located in that part of Philadelphia that sits in the far, northeast corner, feels like it’s not part of the city, but it is. Since 9/11, a number of educators and community members in Philly realized there was something to address at NEHS, because it’s the largest school in the district, it’s fluctuated from thirty-three to thirty-five hundred students and has the greatest number of Arab students. We don’t have hard data on that, because students of Arab heritage are not officially tracked. Some people check off “white,” some people check off “African”—if they’re Egyptian or Sudanese—but they’re Arab, so it’s not an ethnicity that’s documented. But we knew, both anecdotally and from heritage language data that the school district collects—students can self-identify the language that they speak at home—there is a sizable number of Arab students at NEHS. So we raised some funds to have a presence in the school, and we were lucky to have a team of educators interested to support these students. It was a very hostile environment after 9/11 for many of these students. However, with the current leadership at NEHS and some amazing faculty, the climate changed to be much more supportive and eager to address the specific challenges these students face. Especially, I think, after 2008 when a bigger wave of Iraqi refugees started arriving in Philly. Before then, most of the Arab students were Palestinian, so the administration came to realize the challenges of also having a large number of Iraqi refugees coming in, and how to support them. As native speakers of Arabic, the Iraqis were English Language Learners, placed in the ESOL program, versus the Palestinian students who have been here a long time, many of them were born and raised here. They go back to Palestine, they visit regularly and their transnational identity inevitably results in a different set of issues that they struggle with compared to the recent Iraqis who came as refugees. So the administration and some faculty reached out to us, and for the past 10+ years we’ve had a successful partnership at NEHS. The first time Wendy visited the school was October of 2016 and she could immediately see that there are so many interesting things to do in such an ethnically diverse population. Many Northeast students were either born overseas or have parents who were born overseas, so what does that mean and how can we reflect that? Also, the diversity isn’t always channeled in positive ways, it isn’t seen as an asset that’s really harnessed effectively, and there’s just a lot of demand in a school of that size that is always under-resourced. So how can we foster cross-cultural exchange in very intentional ways and use it to uplift many of these voices? You know, you come as an immigrant and what does that mean? How do you function, how do you navigate, how do you adjust and transition to the life here? We’re having these conversations, and then the presidential election happened. Wendy’s first reaction was, We have to do something about immigrants. Given how Trump was speaking so negatively about immigrants, and all the anti-immigrant policies he was proposing on the campaign trail, that he has since pursued. It was the election that jarred us all to think, Okay, this has to be the theme of the project, we have to amplify the voices and images of immigrants/refugees and tell another narrative about immigration. The other task began in January-February, even before she came to start working with the kids, I started to research possibilities for exhibiting the work. So that was a challenge in and of itself. During her first visit, I was thinking four locations, so I took her to four sites: 40th street in West Philadelphia, Germantown Avenue in Germantown, 11th street in South Philly, and in Kensington. 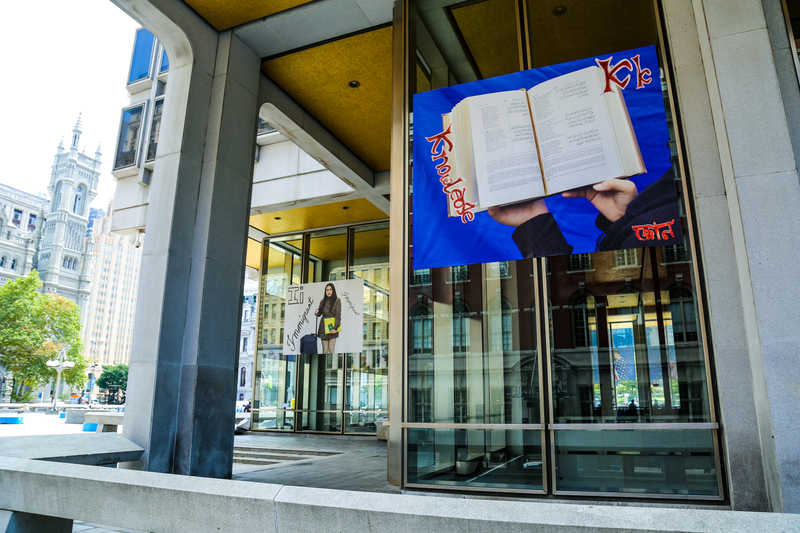 The idea was that even though it was an alphabet, we could hang letters in different neighborhoods, taking the words and images and voices of these Northeast High School students to different parts of the city. A lot of people don’t even know where Northeast High School is, so how could we bring the faces and voices of these students to other neighborhoods, and created cross-Philadelphia exchange? So we pursued that, we knew it was going to grow to be daunting, because for every property owner, you have to have a different permission. But as Wendy thought more about it, and kind of thinking more about the city, she said, “Can you find a central location?” So I started asking around, thinking about it. 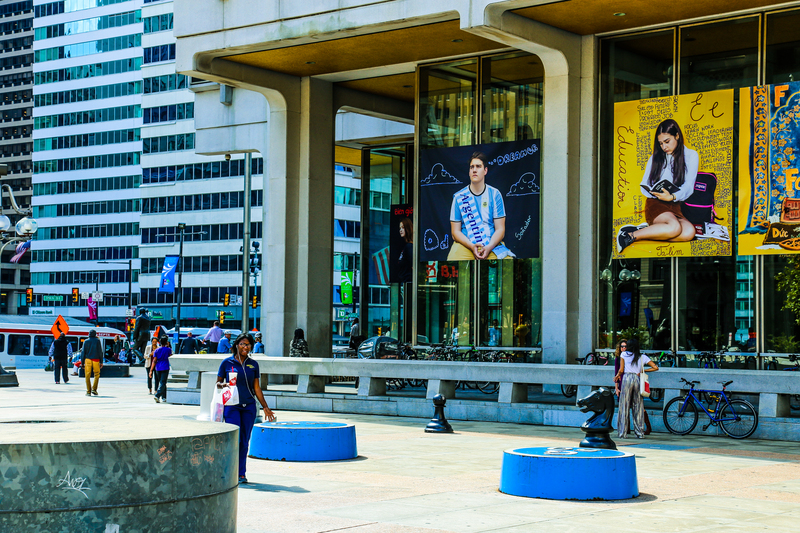 I was first intrigued by 30th Street Station, but we soon enough found out that as the exterior renovations were almost complete, they won’t entertain touching the building with anything hanging on the exterior. It was Andrew Stober at University City District who suggested, “Well, have you looked at the MSB building?” He used to work there. 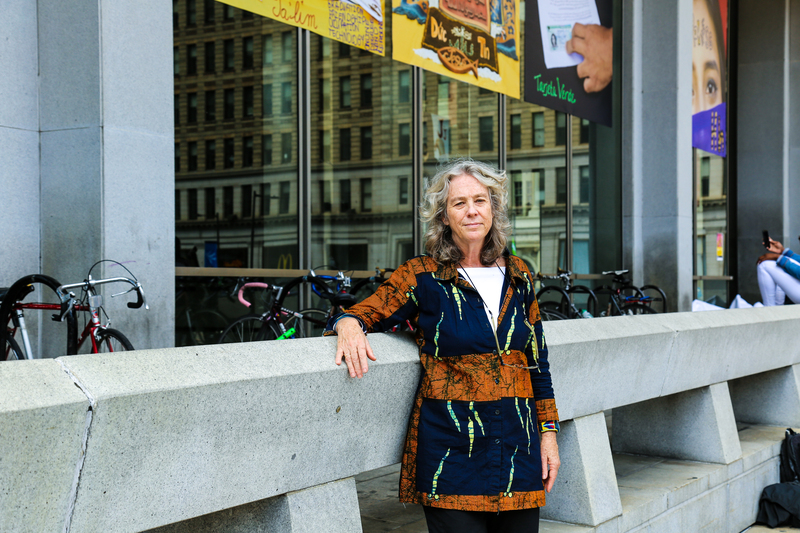 And I said, “Oh, that’s a thought, it’s a free-standing iconic building.” I started looking into it and approached the Office of Arts, Culture and the Creative Economy where I was directed to the Director of Public Art, Margot Berg. I had a meeting with her and she was immediately welcoming. She said, “Oh, the mayor would love this, this is fantastic, especially because it’s about immigrants and immigration”—we knew the theme at the time but we didn’t have any images created yet. And there, magically, we had a site. At the end of the day it wasn’t that difficult to secure the location. It was daunting initially, you don’t know where to start, but I think once we connected with Margot she greatly helped guide us through the process, Things fell into place. The position of the Mayor’s administration was a big help, that this is a sanctuary city and we want to be a welcoming place for immigrants. While Margot helped make the installation happen, the Office of Immigrant Affairs, which is located inside MSB, was very much behind it as well, and they requested to extend the display. 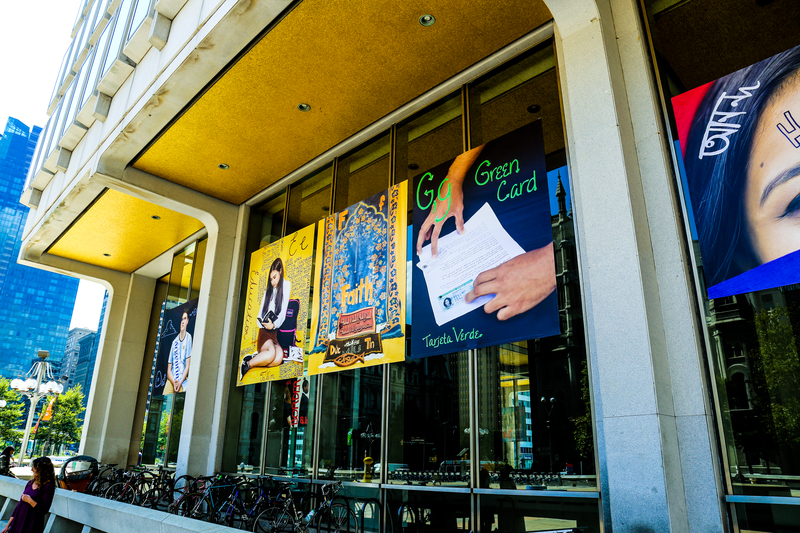 Initially the installation was supposed to be removed in December, but Miriam Enriquez, Director of the Office of Immigrant Affairs put in a request to make it permanent. We then found out that’s not going to be possible, the city has other requests for use of the exterior walls. So they said, No, but you can have an extension, and allowed us to keep it up through July 2018. Even the MSB workers were very supportive, many of them are immigrants or whose parents came as immigrants. It really was fortuitous how all the pieces came together. Al-Bustan made the project happen, but the artists are Wendy and the 18 students. It was very important that they could see that come to fruition. Because you could do art in school and do some amazing work, but not all of that becomes public art at this level, right? (…) So I think that this was really affirming for them and it was hopeful for me to see that. The installers Berry & Homer began to hang the banners on September 6th, my birthday actually. Wendy came from NY that day and I told her, “This is one of the most special birthday gifts to be here with you seeing this project being installed!” There was a lot of angst in July and August with trying to get the photographic files ready for printing—Wendy working with her assistant Pete Mauney to test and retest every print. And there were so many other parts to prepare, there was the printed material, we were working with a graphic designer so we had to get our branding together, the logo of the project, and the rack card that showed all 26 images compiled, the individual postcards with a definition, a quote from the student—because those were the student’s words, really, and we wanted to make sure those were represented—and then a factoid. The students were also involved in selecting the facts, and then our team internally did the final editing. So, the facts, the sources cited, and all this printed material we had to have ready by September 15—the day of the opening and celebration with the Mayor and Office of Immigrant Affairs. In addition, there were the ground decals with quotes from prominent immigrants, some facts about immigrants and immigration to dispel misinformation and counter the bad rap about immigrants, and four key prompts: Why is culture important to you? What borders do you wish did not exist? What memories define you? How are you stereotyped? Why are you in America? We had these prompts printed in Arabic, Chinese, Spanish, and English. So all of that had to be done by September 15. 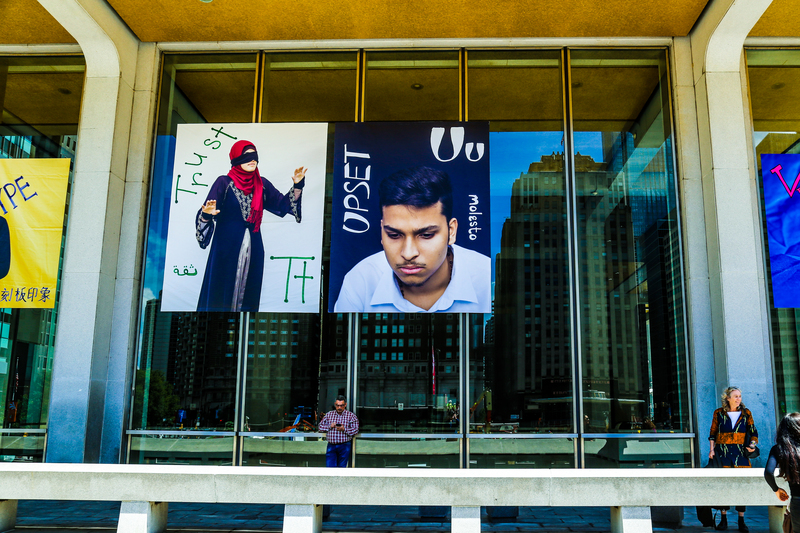 This past spring I met two young men, Pakistani, undergrads at NYU Abu Dhabi, during one of my stays out on the plaza. They were at NYU campus in New York City for the semester and came on a class tour of Philly. They came in the city along Arch Street and the banners caught their attention while they were on the bus. When they had free time to roam the city and walk on their before they had to meet their group, they came to the plaza and I happened to be there so we chatted. It was interesting, these two young men were very intrigued by the installation, and they said, “Yeah this is insightful, it’s also hopeful for us.” Neither was from America, but here they’re getting an American education in Abu Dhabi, coming to America and spending a semester, and seeing this was very affirmative for them. They commented about the languages written on the banners, particularly Urdu and Arabic. We were very intentional, this was something that Wendy also emphasized, that even though this is an American alphabet with an immigrant theme, we wanted to respect and acknowledge that these 18 students that worked on the project had parents from 24 different countries and they spoke multiple languages. So it was important that there be an acknowledgment of other languages, that we live in America and of course the official language is English, but knowing another language is certainly an asset. So it was meaningful to have these two young men from overseas coming by, experiencing this and viewing the project in an affirmative way, recognizing their native language, Urdu, and the language they are studying, Arabic, while living in the UAE. How this project came to have such a big public presence was certainly enhanced by Al-Bustan receiving a Knight Cities Challenge grant. So the Knight Foundation has a Knight Cities Challenge, which was in its third year calling for ideas. We were very lucky, out of 4,500+ applicants from across the country they picked 33 awardees. That funding allowed us to really imagine this project in a much more expansive way in terms of its actual installation as public art. 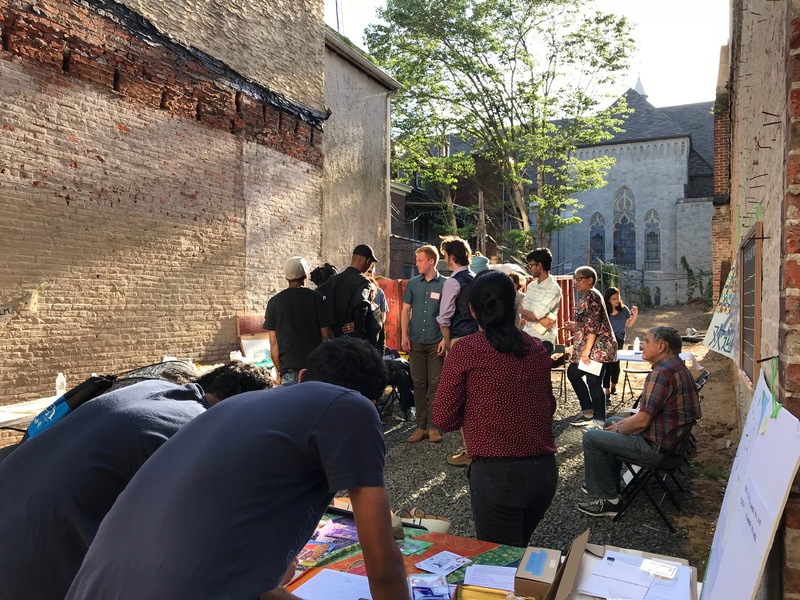 We engaged part of our grant money to work with Public Workshop, which is run by Alex Gilliam, who is an architect and designer in public space. We created five large interactive boards, one asks people to map their ancestry, one has a quote from FDR and a quote from a NEHS student. We had chalkboards where you could answer some prompts. So we wheeled out these boards as many days as we could and used them to engage with the public. We’ve gathered a lot of data from this project and will be publishing a report about it soon. There were generally very, very positive reactions to the installation. Some heated debates happened, some people had more questioning comments. You’ll read in our project assistant Yannick Trapman O’Brien’s blog post about times he was there and the insightful interactions on the plaza, the kind of conversations and ways of communicating with each other, and that this project was an impetus for them to have these conversations, and go away with something that stays with them. We collected responses to questions about culture and community in your Philadelphia neighborhood. One of the interactive chalkboards had the prompt, Write a message of love in your own language, so you’d see the number of languages that people would write, we counted responses in over 70 languages. What was surprising at the end was that the project didn’t get vandalized, none of the images, the banners, the ground decals, or the boards were vandalized. Thomas Paine Plaza, the space where An Immigrant Alphabet was displayed, is a very poorly designed public space, so that was a challenge. You’re not in a place that you can easily capture people’s attention to stay and engage, with little shade and comfortable seating it’s not a place you would stay for long—I mean, besides the skateboarders. If there was a place that was friendly and much more inviting to hang out in, I think our impact would’ve been even greater. I think aesthetically, conceptually, and symbolically, it was a great place to have put this. Logistically, it was easy because it was all on glass walls and we could just use Velcro. But if this installation had been at City Hall around Dilworth Park, we would have gotten much more interaction for sure. The students who participated in this project were greatly impacted in multiple ways. As one student Melika Giyasova told us this past June while we were hanging the banner “E for Education” at NEHS, this experience has meant the world to her, if she hadn’t met everyone involved in the project she wouldn’t be proud of herself now as she’s graduating from NEHS. When the 18 students signed up they really didn’t know how it was going to unfold, and we couldn’t explain every step of the way either, at first. But as they got into it, and saw the process and realized, Oh my God, our image is going to be printed bigger than life and hang in this very central space, and at this quality of printing—they had no idea that this project was going to have such a result. I think it was really affirming for them, and important that they could see the value of working with a professional artist, working on a project from beginning to end, and how they contributed. They are the co-creators in this, with Wendy. Al-Bustan is the producer, we made the project happen, but the artists are Wendy and the 18 students. It was very important that they could see that come to fruition. Because you can do art in school and do some amazing work, but not all of that becomes public art at this level, right? I mean, it may be hung in your school, but it’s not going to be displayed and done at this professional level. So I think that this was really affirming for them and it was hopeful for me to see that, that this project could happen, that the artist already came with this strong belief in a collaborative process, and that the students went along and had so much to say and give of themselves to result in such a powerful representation and message. We invited some people to come and meet him on the site, to see him in action and then have a conversation when he came down to take a break. And he had this method on every project, with people that he meets on site he writes their name on the wall, in between the outline of the letters. 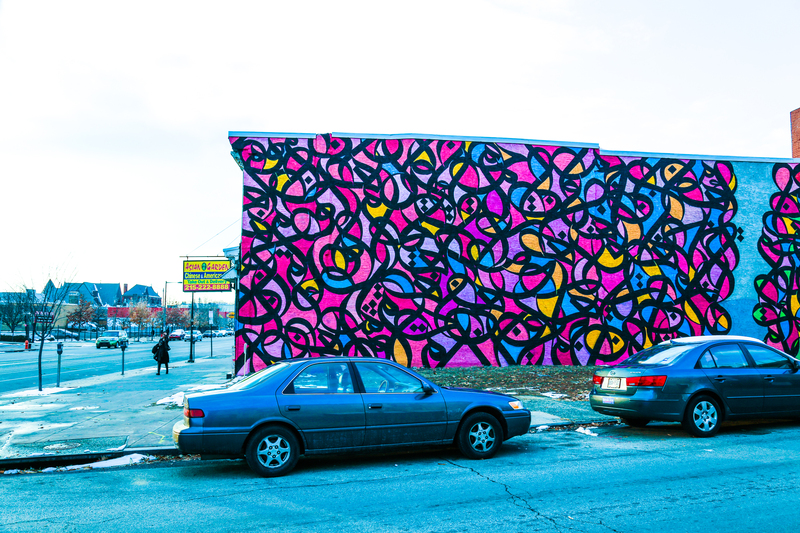 The eL Seed mural, part of (DIS)PLACED: Expressions of Identity in Transition, was created, in partnership with Mural Arts Philadelphia, in November 2017, exactly two months after An Immigrant Alphabet went up *Laughs* I would not have wanted two public art projects to happen in the same season, that was crazy, crazy, crazy for us to pull off. I mean it was a huge effort for us, too, it was a big learning curve, I’m grateful for everything that we did and we learned a lot along the way. We’re looking to be based on 40th street just a block and half south of that location, so what we did last year with the mural is really important in laying a lot of foundation in terms of our relationships and partnerships in the neighborhood. The el Seed project in West Philly was more about community and artists, it was less of this educational component. But in our interactions of course there’s a lot of learning and education happening. 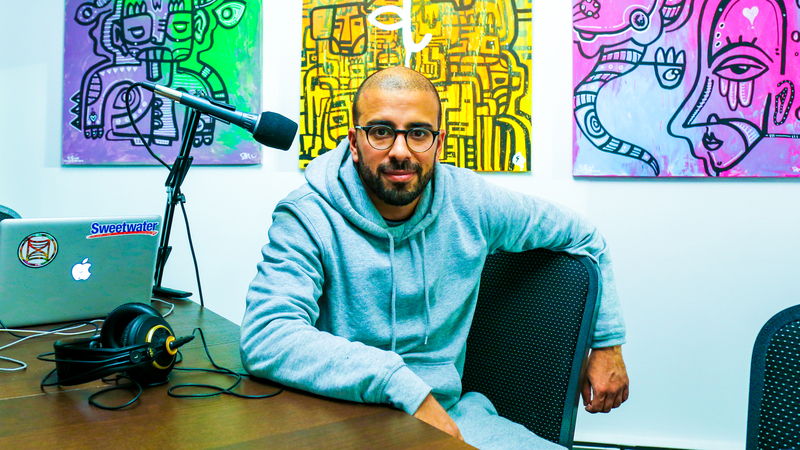 I think el Seed learned a tremendous amount coming here, even though he was only here for a eight days, he learned a lot from the community, and what he contributed opened up people’s minds and eyes to another way of engaging and seeing. eL Seed arrived and within the 48 hours prior had travelled between three time zones. He’d been in Korea, he went back to Dubai, and from Dubai came to Philly. He arrived Friday, and on Saturday from morning to evening he spent time with community members that we had arranged for him to meet. Sunday he got a tour with Mural Arts in Center City because he’d never been to Philly before, then he had a public talk with Conrad Benner for the Streets Dept Podcast in the afternoon. Starting Monday he was on the wall every day until Sunday morning. But while he’s on the wall he’d also come down and talk with passersby. Engaging with people as he worked was part of his capturing interest and getting to know people during that week. We invited people to come and meet him on the site, to see him in action and then have a conversation when he came down to take a break. And he has this method on every project, with people he meets on site he writes their name on the wall, in between the outline of the letters and before the colored spray paint is added over. There’s a quote from W.E.B. Du Bois in the mural, translated into Arabic, along with the phrase “Soul of the Black Bottom”—this was requested by a resident across the street, Kernard Shearlds, who told us about the Black Bottom, and asked, “Can you represent that?” eL Seed says, “I can’t write it in English, I don’t do calligraphy in English.” And he says, “Well even if it’s translated and it’s written in Arabic, that is affirming for us and I can share that with my friends and neighbors, and tell them that’s what it says right here.” So that is what’s written on the wall in between the Du Bois quote. We have to get out of our bubble! We have to get away from our desks! We have to get away from this feeling that everything has to happen digitally, that we are sucked into a digital way of communicating. It’s an easier way, but there’s so much more by just being present, physically, and in public space. For us, the longevity of this project is also important and meaningful. Part of the process is also to think of the potential for art like this—a project that engaged with community members in order to create it, and speaks to the soul of the Black Bottom—to open the door to more community engagement and cultural presentations. I’ve been working with Pam Andrews, a longtime resident who was featured in the project video and gave some remarks at the dedication, she and I are speaking about what to do with the open lot in the corner, in front of the mural. Nearby there’s University Square Apartments, an elderly housing facility on 40th and Market. I noticed that when eL Seed was working on the mural and I was there out on the sidewalk everyday, that the elderly came by either walking with their walker, or with an aid, or on their own, that corner could be a resting spot for them. PHILADANCO!, across the street, they have kids dropped off morning and evening for classes. Parents could come and sit there, perhaps, while they’re waiting. And there are other residents who would welcome an attractive open green space at the corner. It would be minimally designed and the mural becomes a backdrop for pop-up events, possibly a stage performance of dance by PHILADANCO! students, or music, or a poetry reading, or something creative. 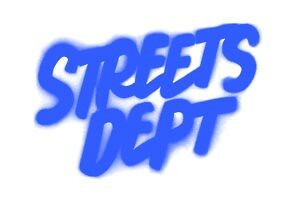 This was the third site that we landed on for the mural. We had two other sites initially. During that process, in getting to that third one, Mural Arts said, “Well, why don’t we just go to Spring Arts? There eL Seed could do whatever he wants along Spring Garden, in these warehouses, nobody’s going to care. And, you know, there’s no community buy-in that you have to get, it would be simpler.” At the time, I thought, We could, but it wouldn’t have as much meaning. One: because the theme that we’re addressing is around (dis)placement, home, identity, and gentrification and its impacts. So, being in Spring Arts where there’s much less of a community identity in the surrounding neighborhood wouldn’t resonates with this theme. 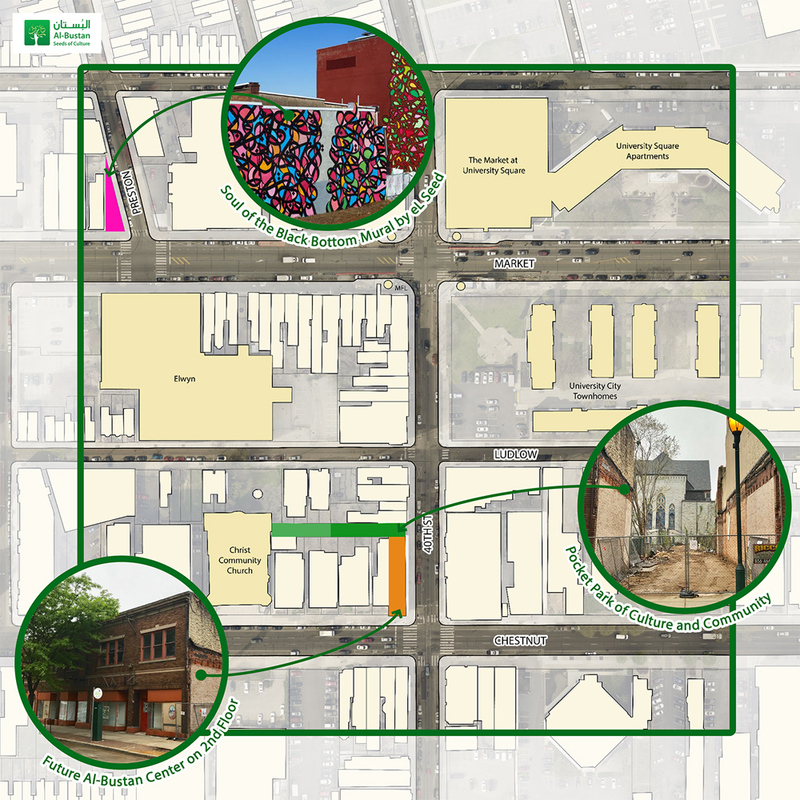 Two: we want to build relationships because we have this vision to be based over the coming year on 40th Street, a few blocks south of the mural site. What I discovered in doing these two public art installations—I knew it before, but I sort of had to experience it first-hand—is that we have to get out of our bubble! We have to get away from our desks! We have to get away from this feeling that everything has to happen digitally, that we are sucked into a digital way of communicating. It’s an easier/faster way, but there’s so much more by just being present, physically, in person in public space. It’s not the same thing as having an email exchange. In September and November I was outdoors most of the time. For the mural I was out there everyday, eight days, all day. At MSB, I was out there for the first three weeks, pretty much everyday too. It was really sweet and beautiful to see the interactions one can have with people from all walks of life, the connections made with friends/colleagues in common and those you’re meeting for the first time. Especially in West Philly I started to see people more than once and have deeper conversations with them. Lifelong residents like Kernard Shearlds, who lives across the street from the mural, who asked us to incorporate the phrase “Soul of the Black Bottom”—he’s a third generation barber, born and raised there, and to him the Black Bottom, the pride and the sense of what that means, is so important. Sure, I’m the driving force through a lot of this, and a continuous thread, but I have to give credit to a lot of people—first to my husband… to our boys… and to the dedicated staff members, community members, teaching artists, guest artists, board members, and many others that have brought us to where we are as an organization, and that’s something that I value and appreciate tremendously. The conversations that began during the eL Seed mural project are informing much of what we’re doing and how we’re approaching our work in West Philly. We knew that whatever we did last fall would help us as we move forward with in creating a Pocket Park of culture and community along 40th Street. It’s only since May when we initiated community conversations around it. The mural happened in November 2017, and then in May 2018 we brought on an intern, Heather Liang, who is full-time for the summer, working as Community Outreach Coordinator for the Pocket Park. We’ve held four forums, we just did our fourth one yesterday, and we’ve been working on gathering community input so it can inform the design of the park, and to explore possibilities in terms of the design, build out, and programming. This is a mid-block infill open lot, and we want it to be a welcoming, inclusive space, where people can come together across race, gender, socio-economics, generations, and have a beautiful uplifting experience. 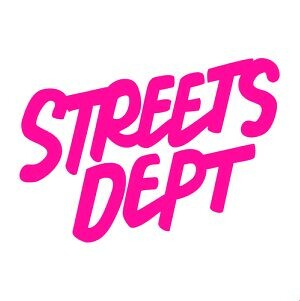 The organization’s recent shift towards working in the public realm is certainly my personal passion and professional experience coming to play. With the pocket park, as daunting as everything is and there’s a lot of things to do and we want to do them responsibly, honestly what excites me the most is that I feel I’m merging my architecture/design background and interest in cities, and taking all the experience and methods we’ve applied around the arts and arts education, and merging them together, so that the pocket park could be a space where it’s well-designed with community input, intentionally designed to be an inclusive space, and programmed with arts and culture. So all of these things that I have learned over the years as a student of art and design, and as an architect, and then as an arts administrator, and believing in the value of bringing people together in public space, and the importance of well-designed space, can come together in a meaningful way. Sometimes I feel like we’re overreaching, and it’s daunting. I feel a sense of responsibility, for sure, sometimes worrying, Can we pull this off? Do we have the funding in place? Do we have the right people on board now? But I’m optimistic. I’m a generally optimistic person and I believe that perseverance and persistence pays off when you have a well-meaning intention and a goal that can make a difference in people’s lives, in people’s experience, self-identity and expression, and bring people together—these are things that we try to do on a daily basis. I mean that’s what’s important to a lot of people that come and work with us, whether they’re international artists or local artists, it’s the coming together, of who they meet in the process. And there’s friendships that have developed over the years through Al-Bustan, the couples that have married, I think we could take credit for *Laughs*, other partnerships that were forged as a result. So I think that’s what keeps me going, and encourages me to continue our efforts and build on what we’ve created. All of this happened through many, many people’s participation and contributions. That I think is important in understanding how things get done. Sure, I’m the driving force through a lot of this, and a continuous thread, but I have to give credit to a lot of people—first to my husband Omar who supported me and the organization in so many ways all these years, to our boys for their inspiration and many hours of volunteer help…and to the dedicated staff members, community members, teaching artists, guest artists, board members, and many others who have brought us to where we are as an organization, and that’s something that I value and appreciate tremendously. You know, it’s always a struggle for an organization of our size—with big ambitions but also financial limitations—as to how we retain staff on an ongoing basis, how do we raise enough money to do what we want to do? It’s not an easy direct path, and so to those who have contributed in some way to this journey, I greatly value and appreciate their time, dedication, love, and support!